One of the more pressing decisions to make as an internet marketer is which affiliate network to promote. After all, there are literally hundreds to choose from. Do they have many high-converting offers to choose from? Do they pay out high commission percentages? Do they pay their affiliates? Do they always pay on time? Do they offer quality tools (creatives) to help me sell? Do they have a good dashboard that shows me my stats, trends, and campaign performance? With the Adcombo Network, the answer to these questions is a resounding YES. So Who And What Is Adcombo? Adcombo is a CPA Marketing Network. For those of you who don’t know what CPA is, it stands for Cost Per Action and it’s an affiliate model that pays you when your referred lead takes a specific action instead of completing an end-sale. These actions could be an impression, click, form submit, contact request, newsletter sign up, registration, or opt-in. The types of CPA offers that AdCombo has includes a wide range of top-selling recognized brand products. Once you register for free as an affiliate, you can promote their offers with your chosen advertising format, earning a defined commission per action. 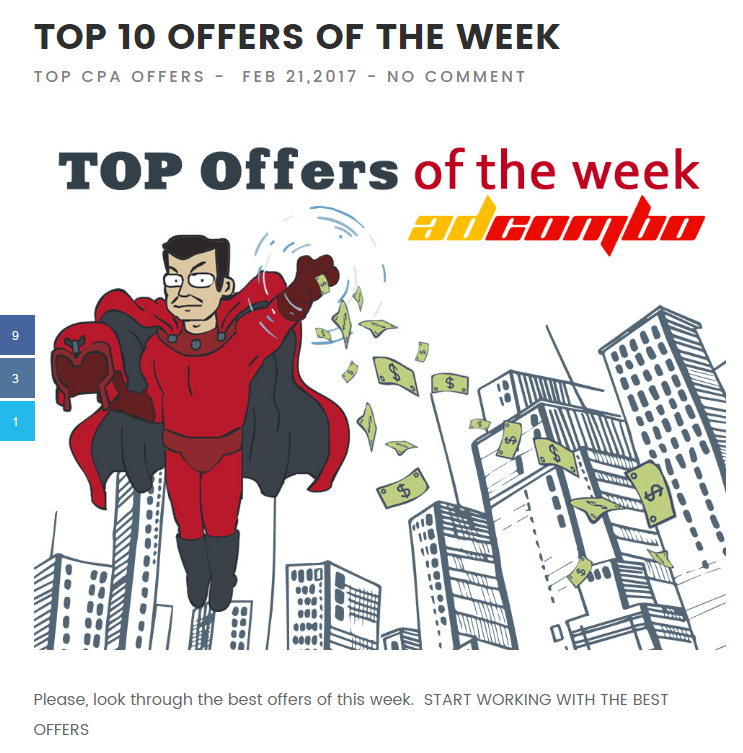 You don’t even have to have your own website to promote CPA offers. You can use other marketing channels such as ad networks, social media, search etc. What’s a 2nd tier? It’s when you get paid to invite other internet marketers to join Adcombo. All you need to do is invite a member to join AdCombo using your personal referral url and that person becomes your referral. Each time your referral successfully completes an action (sale or lead), you will earn a 5% referral commission. For example, if your referral earned $2,000 you would earn $100. The best part is that your extra share is paid by the network, not your referral’s commissions. It’s a win-win! There are over 1000 individual offers you can choose from in nearly every imaginable niche and marketplace. AdCombo is a strong CPA network that will partner with you to make sure you succeed! The post Adcombo Network Review appeared first on High Paying Affiliate Programs.